It is often hard to find just the right chair for a new office or to simply replace an old chair that has either broken or become uncomfortable. There are a lot of things to look for when it comes to shopping for a new chair. These qualities are usually a top priority: Comfort, adjustments, material, color and longevity. This chair has comfort as its priority and it shows. The back of the chair is made of a nylon and polyester fiber mesh that is black. This is the perfect backing for a chair to make it hug the back and support it at the same time. The seat of the chair is soft and comfortable to sit on, it does not have any rods or hard spots anywhere. The seat is even more comfortable when the tilt adjustment is altered to change the angle of the seat. This makes it easy to tailor it to specific needs of comfort wants. The arms are also able to flip upwards incase they get in the way or you need to move around more freely. Incase the seat high is not quiet right, the heigh is adjustable which makes it even better for customization to personal needs. The first and biggest feature of this chair that you will take notice of is the black mesh backing. This is made from a combination of nylon and polyester. These two fabrics make it flexible and yet strong at the same time. This is the perfect combination for a back rest that is both comfortable and strong enough to support the back completely, letting you relax and get comfy while working. 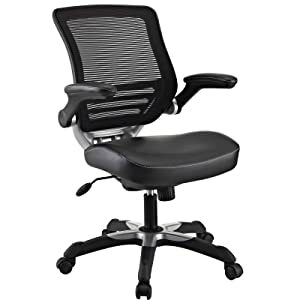 Another good point about having a mesh back to the chair is that it is a breathable fabric that cools the back and prevents any heat from collecting and making your back sweaty and full of tension. The second great part about this chair is the multiple adjustments that can be made throughout. Not only can the height of the chair be altered to suit your needs, but the arms can be turned upwards to make for even more space and room to move about. There is also a tension control that can be changed to alter the tilt of the chair to make for even more customization to make this chair suit your needs and make this chair truly yours. The third and possible best feature of this chair is that its seat is made from a spongey material that is them covered in a mesh fabric as well. The sponge material makes it conform to your bottom for the ultimate comfort in seat position. The seat takes all the stress off of the spine and makes it easier to relax. The sponge being covered in a mesh fabric also helps it breathe and keep heat away from your seat. This prevents the bottom of the chair from getting warm and uncomfortable. Sponge seat with mesh fabric covering. Frame is made from iron. Tilt-up arms for added room. It is a leatherette material and not real leather. This is a wonderful office chair to own, it is a great value of comfort and support. Although the chair does not have any real leather on it, it has a very well made mesh fabric throughout that helps keep the buyer cool and relaxed. When sitting at a chair for a long period of time it is important to stay cool, relaxed and comfortable. This chair provides all of those qualities. This chair is a great buy and is sure to make any owner proud and happy.